If you're looking at transmitting some hefty torque, and want to compare and contrast your options... we're hoping to lighten your load by providing you a handful of bullet points to consider. The diaphragm coupling is considered to be stronger than the disc coupling and can be made in larger diameters than the disc coupling. (Note diameter is an indicator of torque capability. The diaphragm coupling is considered to have more axial displacement capability at lower forces than the disc coupling. Single straight contoured diaphragm couplings eliminate the fretting corrosion associated with multiple elements. Single wavy types have more axial capability. 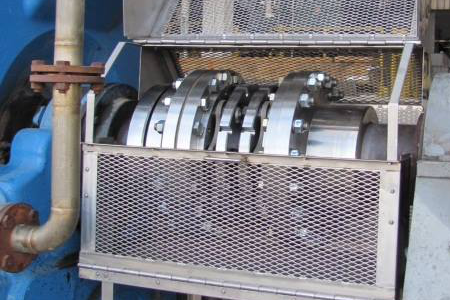 Diaphragm couplings disconnect upon failure, which can be beneficial to the connected machinery. It becomes a fusible link. In contrast with gear couplings, both the disc and the diaphragm are non-lubricated, low maintenance, infinite life couplings. Disc and diaphragm both produce lower reactionary loads than gear couplings when misaligned. Disc and diaphragm both accept greater misalignment at higher speeds than gear couplings. Disc and diaphragm both are easier to balance than the gear coupling. The gear coupling has the lowest first cost and the least sensitivity to rough circumstances. The gear coupling has the most axial displacement capability. The gear coupling has the highest power density. Gear coupling life is determined by wear, and overload generally results in reduced wear life rather than abrupt failure. This is subject to existing wear and the size of the overload. The disc coupling is usually smaller in diameter than the diaphragm coupling. The disc coupling is usually less expensive in first cost than the diaphragm coupling. The disc coupling has a built in overload capability. Disc failure, while it may be abrupt, will not disconnect the coupling if the bolts are capable of carrying the load in shear. This feature often can allow the coupling to continue operating through an orderly shutdown.